Every society has to explain their world. Ancient Egyptians believed in the “eternal now” – things are now as have always been and things will always be as they are now. They didn’t explain the world in the way Greeks or anyone else would. The Greeks invented history as a way to do it. They knew that things were not always as they were in any given moment. Egyptians, nor anyone before the Greeks, conceived of the idea of investigating the past as a means of understanding the present. People and societies have used and still use many ways to explain the world. Religion explains for many a divine will at work, science strives to be more rational, mathematics has been used as a way to quantify the world in various ways, sociology to help us understand how humans work in social groupings, and many more. Many different methods have often been used in combination with one another. Literature has also been used to explore the human condition as with Homer in his Odyssey. Art has been used to express how we perceive the world and how we think it ought to be. 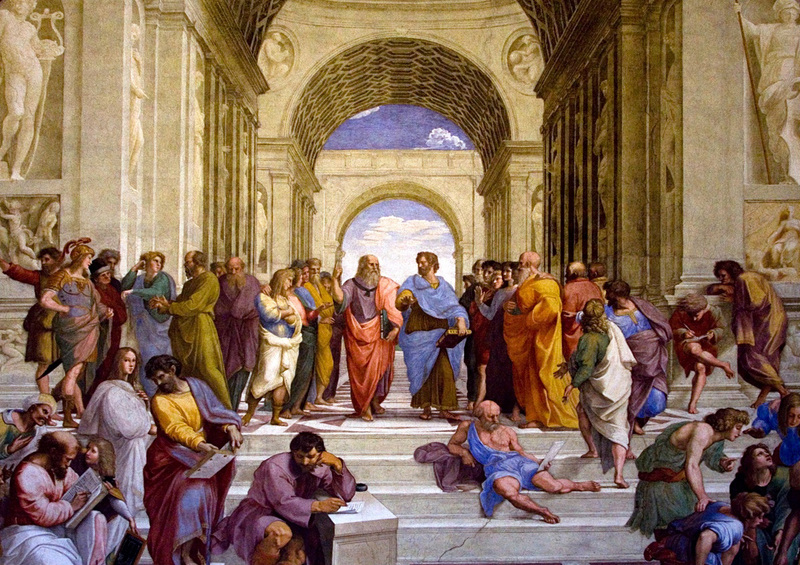 Philosophy – literally “love of wisdom” in Greek – has long been a popular tool and became one for the Greeks as well. 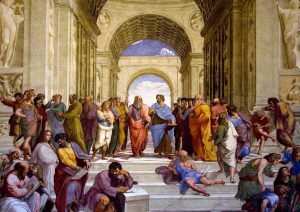 Some strategies were invented by the Greeks such as history and, many argue, philosophy, as well as different forms of science and mathematics. One branch of literature in ancient Greece was theatre. Greeks saw the theatre as a place in which their world might be explained. 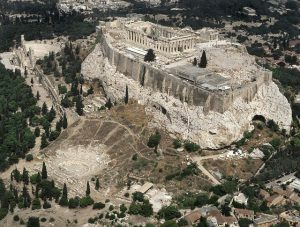 In Athens, the theatre was located just below the Acropolis. Both comedy and tragedy were used. Part of their agonistic civilization involved plays being performed in open competitions between playwrights with judges and awards. The plays were competing views of understanding the world. 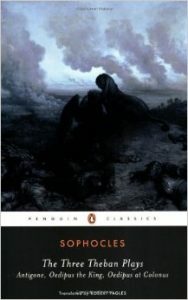 Sophocles wrote Antigone, and this play gets to the heart of this discussion. Creon in the play is the king of Thebes, and Antigone is betrothed to his son Haimon. The conflict pits Antigone against Creon. Her brothers, Eteocles and Polynices, fight over Thebes and kill each other. 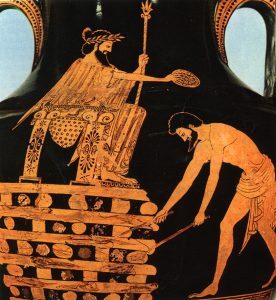 Creon declares that the body of Polynices, now considered a traitor, is to be left on the open field while Eteocles, now considered a hero, will be properly buried. Antigone sought help from her sister Ismene to bury their brother, but Ismene refused. Creon had declared the punishment to be death for anyone who tried to bury Polynices. In the end, Ismene would decide (too late) to help her sister, and Creon would change his mind. Greeks did not condone stubbornness, and Sophocles included mind changes in the play. Indeed, they were the only two who would survive in the play. Greeks did not attend plays in the same way that we watch movies as an escapist event. Theatre was engagement and confrontation for them. They wanted plays to bring up issues that they faced every day to see how they might be resolved. Every play has a crisis, and for Greeks this crisis was the decision to take personal responsibility. They believed every person was responsible for her/his actions and decisions. Creon conceded in the end that his own law was a bad one. Defending herself when brought before him, Antigone said that the law of the gods was higher than the law of Thebes. Bodies were not to be left unburied, and even Hector pleaded with Achilles to make sure he was buried and not to leave his body to be gnawed by beasts. Should people obey what they perceive to be a bad law? 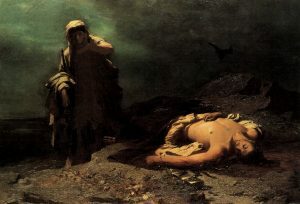 Antigone was condemned for her crime and walled in to an area where she hanged herself, and Haimon committed suicide after finding her body. Creon’s wife committed suicide as well in grief over the loss of her son Haimon. The play is resolved with the death of a number of characters in it. Asking who is heroic in the play is a subjective question. 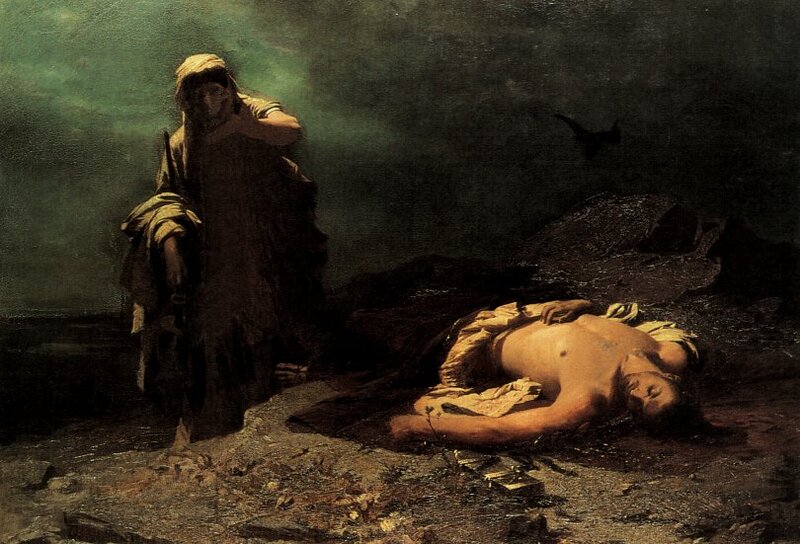 Many see the willingness to die for one’s beliefs, as did Antigone to bury her brother, as heroic. Some say she was brave but not necessarily heroic – stubborn people can be brave, but the Greeks did not view stubbornness as heroic. Antigone did say she would not have done it if she had been a widowed mother as there may be another husband or for a dead son as she could have another child. She was only willing to defy the law of Thebes in favor of the law of the gods in this manner because she could never have another brother. In Creon’s view, people must obey the law or chaos will result. He declared Polynices a traitor of the state, and traitors were not to receive proper burials. The law cannot be set aside simply to spare even family members who violate it. His son Haimon told him not to be so stubborn, but he held firm. The point is that there are different reasons to question motives. 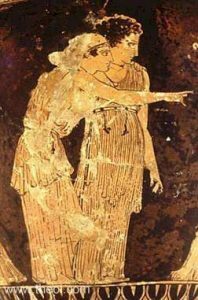 Even Ismene was not allowed to help when she changed her mind as she saw that Antigone was “hogging” what she saw as heroism? Creon’s actions also express views of women at the time Sophocles wrote this and the role they were expected to play. He told Haimon not to worry about the loss of Antigone because another wife could be found for him – “There are other fields for him to furrow.” She was replaceable. Ismene refused to help at first, telling Antigone that women were born unfit to battle men and were merely subjects to Creon their king. Women were not expected to have any will much less express it or have it expressed for them. Creon said that if he gave in then he would be a woman and she the king. He said they should, “…defend orderly people and never let women get the best of us.” This play includes generational and religious conflict. The gods played an important role in Greek thinking. Greek gods were anthropomorphic – human-shaped with human traits. They looked, acted, spoke, complained, “sinned”, cheated, etc., just like us. Zeus was seen as parenting many, but he would be expected to use many women (including his sister-wife Hera). As a polytheistic society, Greeks explained events by the vagaries of divine will – that we and events here are expressions of events between the gods. They believed that certain people could cross the divide between mortal and divine because the gods were like us in so many ways. 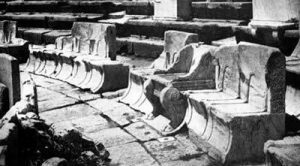 The Greeks believed in oracles, the most famous being the Delphic Oracle (though this was one of several) and used it as another way to explain the world. Oracles had shrines where people could go to pose questions and receive divine answers – should we go to war? should I travel to XYZ place? should I marry so-and-so? Different oracles used different gods and goddesses. The Delphic Oracle used Apollo, the god of wisdom, and would provide answers in poetic form. The oracle would “get high,” mumble and stammer, and this would be transcribed into this poetic form by others. King Croesus of Lydia sent a messenger to the Delphic Oracle before attacking Persia, and the messenger returned and told him that a great empire would be destroyed. He launched the attack and lost horribly, not thinking it could be his own empire that would be destroyed! An oracle’s advice was called a maxim – words to live by, general advice. The maxims we know traveled very far as they have been found inscribed in stone in Afghanistan. 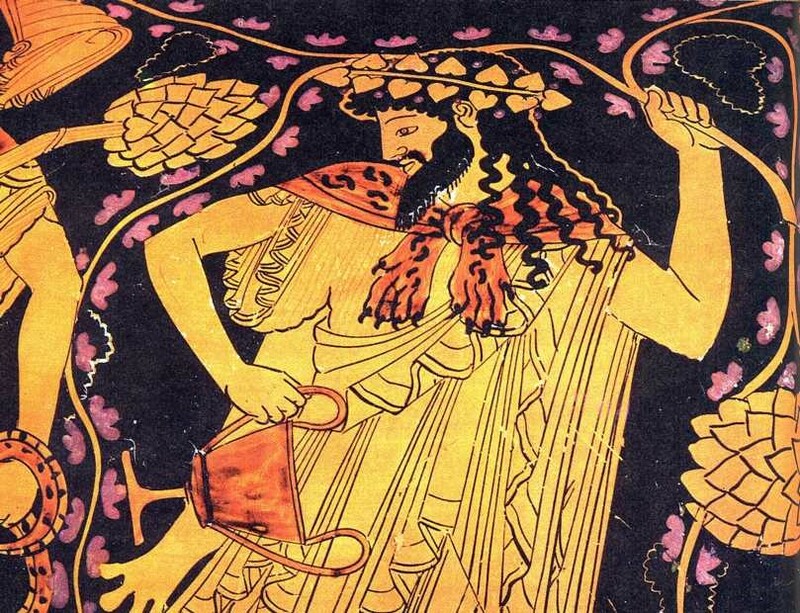 The Dionysus Cult was named after Dionysus, the god of “good times.” He was considered a dangerous deity as the god of wine and revelry with tremendous power over people. 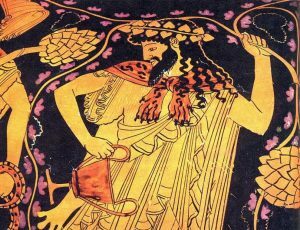 The Greeks saw wine as a gift to humans from Dionysus and believed that they invited him into themselves when they drank it. When they became drunk, they were “filled with the essence of Dionysus” – they surrendered themselves to him and were slurring and stumbling because the body had a hard time with it. Dionysus would eventually “get out” and the person would return to normal. Women, considered an imperfect form of men, were less able to “handle Dionysus”. They would get drunk faster because they were not endowed with the right defenses. 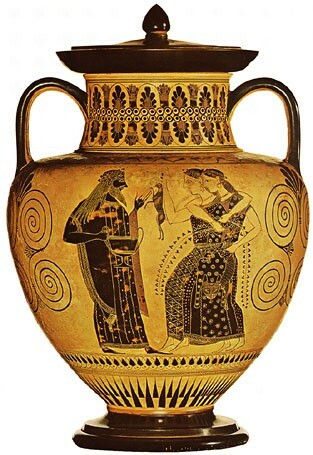 Greek men felt their women should be careful interacting with Dionysus. They were only allowed to drink once each year as part of worship in the Dionysus Cult to consort with the god. A woman drunk and under the power of Dionysus was called a maenad. Greeks said women were not strong enough to expel Dionysus from the body and instead had to give him a gift. They had to go to a field and find a small warm-blooded animal such as a rabbit as a suitable gift, rip the animal apart, and consume its raw flesh. That gift brought Dionysus out and the women were normal again until the next year. Far and away, the Greeks used two major methods to explain the world, applying these methods to history, philosophy, theater, and all other means: Hubris/Nemesis and Phsyis/Nomos. Herodotus, who invented the word history, has writings filled with the notions of hubris and nemesis. Hubris is anything or any emotion that is excessive – love/hate/envy/etc. Too much gives one hubris. The Greeks saw excess as a bad thing. They didn’t see hubris as necessarily the person’s fault – it may have been inherited, for example, or a part of them due to factors beyond their control. But they would be punished for it nonetheless – by nemesis. A carrot that grew far larger than others would be seen to have hubris – outside of what the gods had created as the norm. A man who was much taller than everyone else would be seen to have hubris. It wasn’t his fault, but he still had it. This offended the gods and nemesis must strike because hubris must be punished. A whole country could have hubris. Herodotus explained that the inability of the great Persian Empire to defeat relatively small city-states compared to it was because it had hubris – it was far too large and required nemesis. Even those they admired could have hubris – great athletes who had arete would eventually lose to someone with greater arete, great generals would eventually be killed, etc. Hubris and the nemesis it incurred were inevitable. Croesus was considered the most powerful and wealthy man of his time, but Herodotus wrote that he had hubris. An ancestor seven generations before him had incurred the anger of the gods. That ancestor was the closest advisor to the king, who asked him if he (the king) was the wealthiest and luckiest man in the world, and the advisor said yes. He told the advisor to enter a closet and see his wife naked to know how truly lucky he was. The advisor said that would be wrong, but the man insisted and the advisor gave in. The wife spotted him but didn’t say anything. She was angry and later confronted the advisor. She said he could either kill himself on the spot or kill her husband instead and take his place to avenge her honor. He obviously chose to kill her husband and become a very wealthy man with a beautiful wife, which the Greeks would see as the wrong choice. From then on the family would be plagued with constant hubris and nemesis. 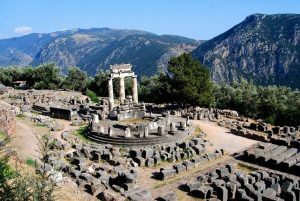 Croesus eventually misunderstood the Delphic Oracle and lost his great empire. Herodotus also wrote of an island tyrant named Kallikrates. He had enormous wealth and power, and he was warned that he had too much hubris and would suffer nemesis. He decided that he would throw away his most valued possession – his favorite ring – to avoid nemesis. He threw the ring into the ocean and pled to the gods that he no longer had hubris. Herodotus wrote that a week later a fisherman came to him telling him of an enormous fish he caught. The fish would be seen to have hubris, but this was overlooked by the ruler. He took the fish, and while he was eating it his ring popped out. He saw the gods as giving him back hubris, and a week later his kingdom was destroyed. This notion of hubris and nemesis can be applied to almost anything in life. After Herodotus wrote his history, Thucydides wrote his own about the Peloponnesian War and decided hubris/nemesis was not the way to explain events. He certainly could have used it to say that Athens was destroyed because of its hubris and that Alcibiades was killed because of his own hubris. But physis and nomos had now emerged in Greece and replaced hubris and nemesis in many Greek minds. There is a difference between natural law (physis) and manmade law (nomos). If you jump off a 10-story building, what will happen will happen and cannot be stopped. But unnatural laws are created by people and govern everyday life – the customs and conventions we impose upon ourselves. Nothing in nature (physis) stops a person from killing another, only nomos seeks to prevent this. The Greeks believed this distinction should be remembered when making decisions. If a decision must be made contrary to nomos (as with Antigone who did not agree with the law), then something may happen as a consequence. A red traffic light is nomos – you are expected to stop, but nothing naturally stops you. If an 18-wheeler comes through the intersection when you run the red light before you make it through, then what happens next is physis. Ignoring nomos could, but may not, lead to physis. Greek philosophers were called sophists (wise ones). They were professional wise men who traveled to poleis (city-states) to teach for money – they didn’t just wander around spouting words. They trained others and taught in terms of physis and nomos (not hubris and nemesis). Always associate physis/nomos with the sophists. 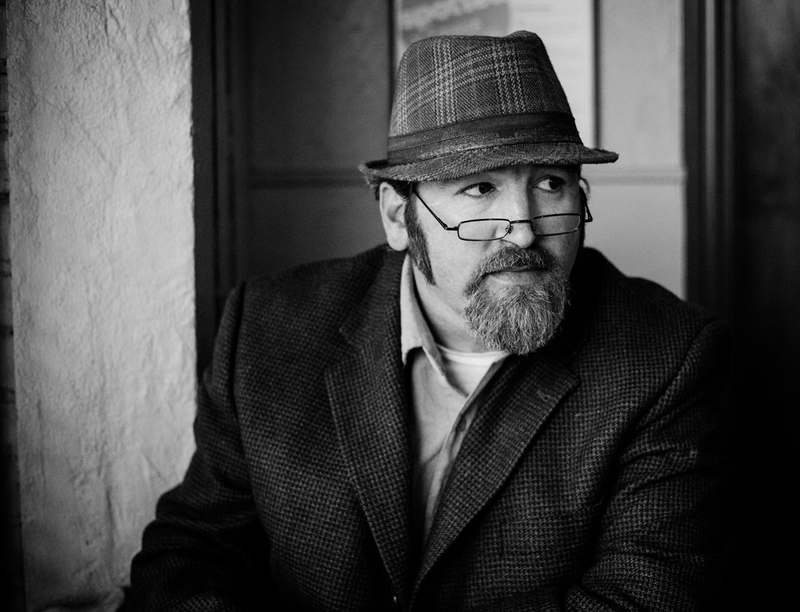 Sophists taught rhetoric – the art of persuasion; the effective use of words to win arguments. Today we see rhetoric as empty talk, but it was much different to Greeks. Athens being a radical democracy required all male citizens to possess some rhetorical skill to publicly promote and debate laws, sue and defend in court, etc. Sophists, realizing this about Athens, flocked there and were paid as tutors to young Athenians. They taught students how to win. They did not address right and wrong – their only concern was to win. An argument wasn’t about truth but about who could better convince the audience. Sophists used antilogies (contrasting speech). They would pose a question to students who would then be expected to both support and refute an argument. Their personal beliefs were irrelevant. They also used sumpheron – the use of any beneficial or advantageous argument to win. Prognosis mean to know something in advance and prepare for it. Many Athenian students went on to apply this to medicine and the word is still used today to indicate knowledge of what the course of a disease or treatment will be. Prognosis in rhetoric meant anticipating an argument and being ready to respond. That’s why they used antilogies – to train by arguing both sides. This gave rise to the notion, “The strong do what they wish; the weak do what they must.” It was a ruthless, amoral system of thought. The Athenians didn’t care if attacking small, weak polis of Melos was right or wrong, for example. They were sophistically taught to win above all else with no consideration of morality. Of import also are “min de” clauses. Min (on the one hand), de (on the other) – Greeks saw everything this way, as an either/or proposition. This, combined with initially hubris/nemesis and then physis/nomos, drastically affected the way they analyzed the world. ← Israeli PM Rejects $40 Billion Aid Offer, Wants More – What About ‘Homeless Vets and Starving Children’?